Adventure Time (With Finn and Jake) is right up there with My Little Pony in the pantheon of "kids' TV shows that way too many adults watch and enjoy because they're actually really good, and also the internet loves them." So it isn't very surprising that D3 Publisher has announced that Adventure Time will be coming to the 3DS. What is surprising is that it hasn't happened before now. Adventure Time is the story of Finn the human boy and Jake, his shape-shifting magical dog friend, and the crazy adventures they have in the post-apocalyptic Land of Ooo (Land of Oo? Oooo? I never remember). They travel to distant lands, battle fiendish foes like demon lords and the lonely, princess-stealing Ice King, and chill with Princess Bubblegum and Marceline the Vampire Queen in the meantime. In other words, it's perfect videogame material. 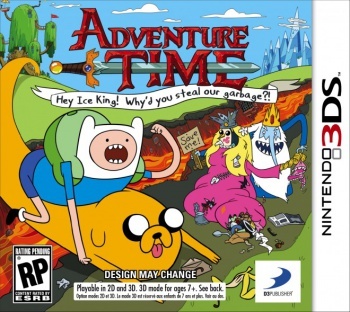 In the game, the sort-of-nefarious-but-really-kind-of-pathetic Ice King is going around stealing the garbage from the residents of Ooo to create his own Garbage Queen, and Finn and Jake must stop him. Well, they'll probably stop him, but they could just go check out what's up because they're bored; Adventure Time is kind of quirky like that. Adventure Time: Hey Ice King! Why'd You Steal Our Garbage?! will be developed by WayForward, the makers of the critically acclaimed DSiWare game Shantae: Risky's Revenge. Adventure Time series creator Pendleton Ward will be on hand in "designing a new storyline and quests." Hopefully we'll see the rest of the Adventure Time crew show up like Lumpy Space Princess and BMO. Even more hopefully, there'll be a new song from vampire rocker Marceline, because damn that undead queen can sing. Adventure Time: Hey Ice King! Why'd You Steal Our Garbage?! is slated to hit stores this Fall.